It seems that recently Australia has been finally catching up with the rest of the world in the skin care game. As such, it shouldn’t have shocked me to walk into my local Mecca Maxima and see Mizon products. But I’m not going to lie, I squealed in excitement. I’ve wanted to try Korean skin care for ages but as I don’t speak or read Korean (unlike Japanese which is actually my major and therefore makes up half of my routine), I wasn’t too confident buying it online. 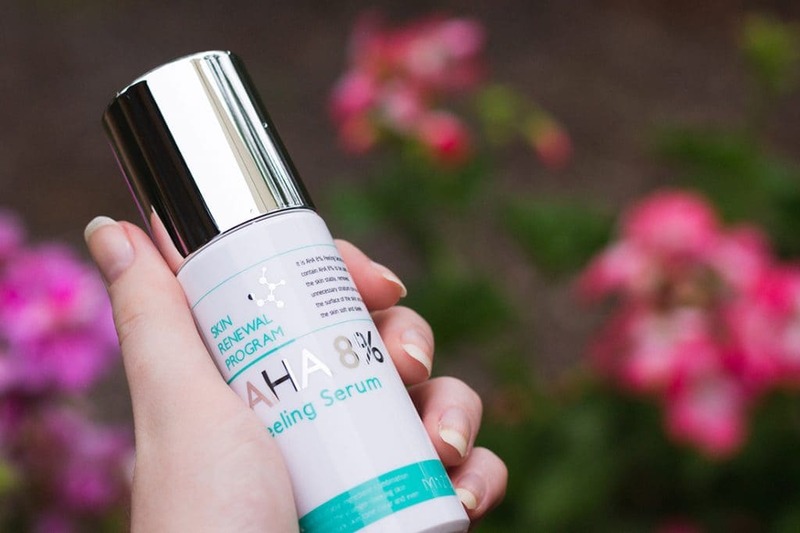 Mizon’s AHA 8% Peeling Serum seemed like the natural choice after my year long abstinence from actives as I repaired my dehydration. I needed gentle exfoliating and this serum delivers just that, and it’s free from fatty alcohols – woohoo! Its key exfoliating ingredient is 8% glycolic acid at a pH of 2 (making it super effective) which is perfect for every day or a few times a week. At $35 AUD buying it in person it was a bit (very) steep but I figured I could always order it again online for far cheaper (such as from here) if I really liked it (and spoiler alert: I do). Anyone who’s ever used asian beauty products before knows about their funny english, presumably due to translation issues. I particularly like some of the sentences on the outer box here – I can’t figure them out! (I’m not poking fun at foreign people’s English – I’ve been studying languages for upwards of 9 years and trust me when I say I’m a lot worse than they are.) Good on them for promoting sunscreen use which is vital when using an AHA as it heightens sensitivity to the sun. The ingredients are also listed below. The packing is really nice, with a fine pipette style dispenser and a chrome cap. The dropper button pops up as you twist off the cap, making it really leak proof. The plastic case is also tough and ideal for travel, but has a weight to it that makes the product feel expensive. You get a reasonably generous 50ml which I would guess is going to last me around 6 months of regular every other day use. The product itself is a thin, clear gel serum with a light fresh fragrance (which I can’t quite put my finger on). However it disappears pretty quickly if that’s something that bothers you. There’s alcohol in the ingredients, which isn’t ideal for dehydrated skin but it dries down nicely and goes well under moisturiser, which is where it belongs in your routine. There’s a bit of internet contention about pH dependent products like exfoliants and whether you need to wait before applying moisturiser on top. I play it safe and go for about 10-15 minutes to make sure it’s working its best. My feelings – would I buy it again? 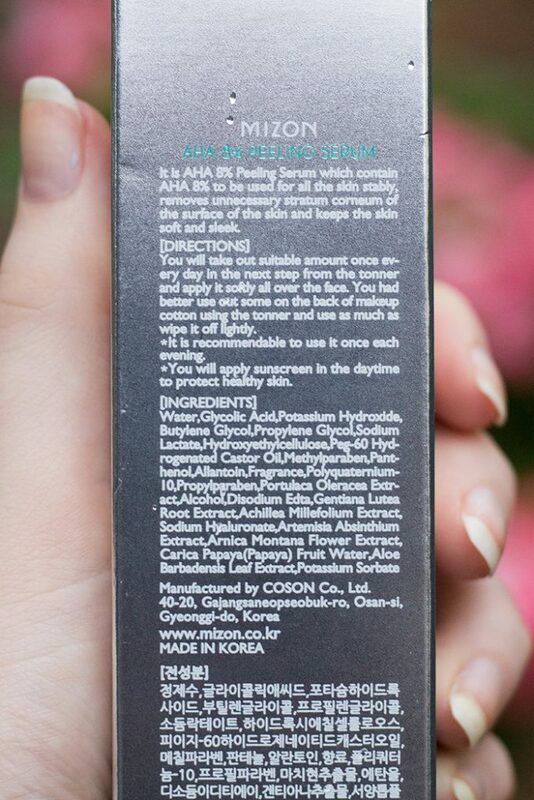 I’d say Mizon’s AHA 8% Peeling Serum is my favourite AHA I’ve tried so far. In the few weeks I’ve been trying it out I’ve experienced very little irritation or flaking, a bit of purging (which is deeper acne coming to the surface) and a HUGE increase in glow and smoothness. It doesn’t sting on application like many other exfoliants I’ve tried though that could be due to the healthier condition of my skin at the moment. Overall, It’s a great addition to my routine and I’ll be repurchasing! I’d recommend this for beginners to asian beauty or AHA exfoliants, or for those who can’t use my other recommendation Derma E Overnight Peel due to fatty alcohol sensitivity. Next on my review list is The Ordinary’s 2% Retinol. Keep your eyes peeled for that!